The general contractor is a joint venture between Massman Construction, Traylor Brothers, and Alberici Constructors (MTA). 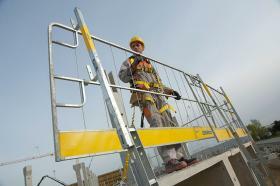 Main focus of the contractor is to stay on track while providing a safe working environment. The Mississippi River Bridge is a cable stay bridge with two pylons. The bridge design includes two pylons projecting vertically from the Mississippi river bed with 6 m deep footings. The lower pylon is 20,7 m high x 6,7 m wide x 39,3 m long, projecting from the river in a Y configuration. The tower elevates to 123 m above the footing. 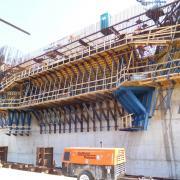 MTA incorporated Doka’s D22 dam formwork for the lower portion of the pylon. This consisted of seven lifts with gangs fabricated by Doka for nearly every lift. The formwork provided a working platform with ample space for the laborers to work from, as well as an area to stage equipment. The D22 forms were suspended on climbing shoes that encompass the entire perimeter of both pylons. Twenty-two lifts utilizing automatic climbing systems SKE 100 and SKE 50 were used for all four tower legs. Using the automatic climbing systems allows for faster overall completion time because raising the formwork could proceed in all weather and wind conditions (up to 40 mph) and allowed gangs to lift independent of a tower crane. To provide an area to pour footings, MTA had to install a coffer dam and pump the Mississippi River water out of the coffer dam. The contactor used Doka’s girder forms to form an 26,8 m x 16,8 m x 6,1 m deep footing. All standard girder forms are the same depth, which greatly reduces or eliminates shimming form joints. Doka’s steel girder forms are modular, and can be ganged and picked in large sections. With capabilities to form concrete and support concrete loads on structures such as beams or bridge pier caps, the steel girder form will span large distances without any additional support or shoring. 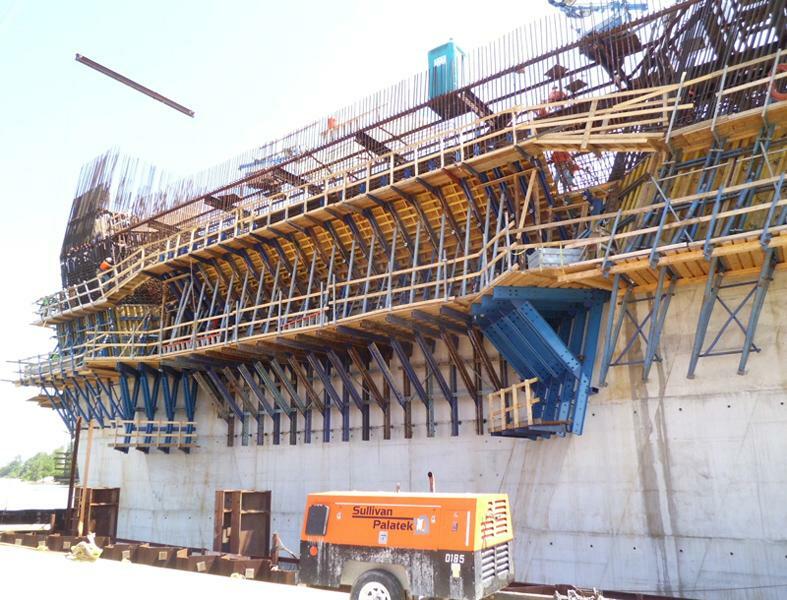 The biggest advantages of Doka’s formwork is that the girders for the footings offered MTA a heavy duty gang system that was easily installed and required a minimal number of forms. Doka’s heavy duty spindle struts along with custom channels provided for maximum security when hanging forms from the pylon face. There were areas located at the eyebrow where the concrete face projected out at a 35 degree angle. At lifts five through seven of the lower pylon eyebrow, separate Top 50 gangs had to be assembled for all three lifts at the haunch area. Design of custom support brackets for single sided walls required involvement of two engineers and use engineering of design programs to develop the most economical solutions. Doka worked closely with JV:MTA to ensure there were no conflicts with the form design and provide the most economical and efficient forming system on the market. Both tower legs were converted from a tie solution to a tieless solution resulting in Doka designing and installing W16’s walers running vertically along back of the Top 50 gangs. SKE 100 and SKE 50 automatic climbing systems were incorporated for the tower legs along with Framax Xlife forms for the interior core of all four legs and Top 50 gangs for the exterior leg face. Custom steel brackets and splice plates were used to connect gang forms together. Additionally, a custom aluminum pouring platform was incorporated that MTA installed above +1 platform. The +1 platform provided a secure, lightweight surface and allowed laborers to work safely and easily well above gangs while pouring concrete into each wall cell. A custom protection screen was used on the outside face of Doka’s SKE climbing system as a method to cocoon working platforms, keeping workers safe and comfortable during the harsh weather in the winter. Doka’s SKE climbing systems offered MTA a method to easily climb all four legs safely, efficiently and independent from using a tower crane, therefore saving the contractor valuable time and money. 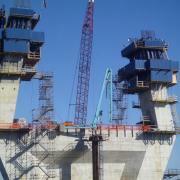 Flexibility of Doka’s climbing and formwork systems easily adapted to the bridge geometry and contractor’s requirements. 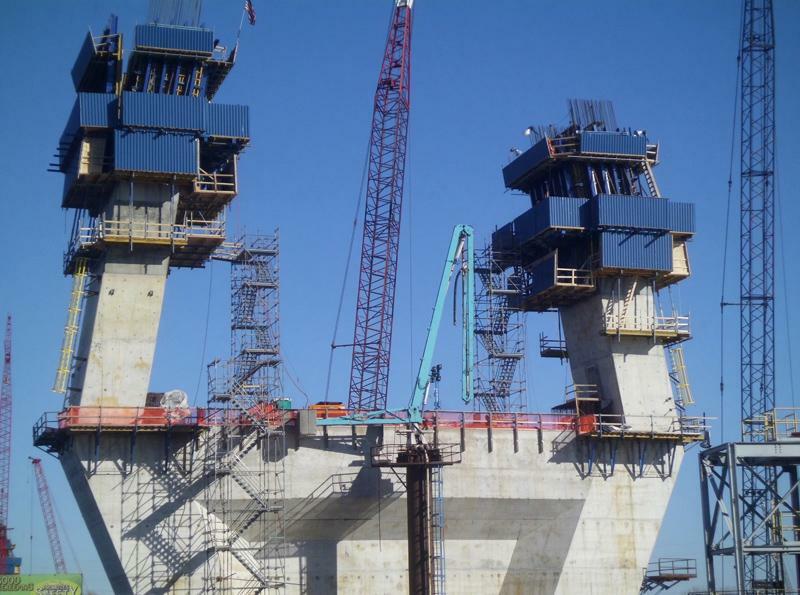 Engineering support, know-how and experience on previous and current bridge projects all over the globe, along with competitive pricing, reassured the contractor’s decision to go with Doka. Doka’s forms and concepts maximized efficiency and safety. Thank you for your interest - Keeping the Mississippi River Bridge on track. Thank you very much for your interest - Keeping the Mississippi River Bridge on track.